My wife and I are working to pay off our fixed-rate, conventional, fifteen-year mortgage. Our goal is to eliminate our mortgage debt in less than 10 years. We have been paying off our mortgage for 7 years now – and it’s cool to see more and more of our monthly payment go towards our principal. 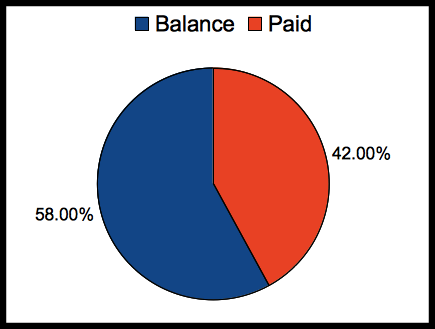 The percentages above represent the amount of our mortgage we have paid – 42% – and the amount we still owe – 58%. We make our regular, monthly payment on the first of each month. We make an additional, principal-only payment on the fifth of each month. On the fifteenth of each month, if we have managed to earn or save any money, we send and additional, principal-only payments. Payments are initiated via our online bank, and a notation of “principal-only” is included, when applicable. This chart doesn’t represent our entire equity; it represents the amount we still owe on our mortgage. Thank you for patience between regular posts. We’ve had an exciting but busy few months.